omong | New Malaysia (no BN, no BS) or Better Nation (more BS from BN) ? After the police revealed the staggering RM1bil market value of seized luxury items from six residences linked to Datuk Seri Najib Tun Razak, the former premier has insisted that, under the law, it is not illegal to receive gifts. In an exclusive interview with Malaysiakini on Wesdnesday (June 27), Najib said that as head of government over the years, “we have been gifted with a lot of items by foreign leaders as well as personal friends”. Malaysia would have been able to go ahead with the shelved mega-projects if not for the 1Malaysia Development Bhd (1MDB) scandal and other “mini 1MDBs” that are plaguing the country, said Finance Minister Lim Guan Eng. “We would have been able to afford all these, including the originally planned light rail transit 3 (LRT 3). “The 1MDB scandal itself cost us RM50bil. “The authorities need to realise that I am an ordinary citizen too. 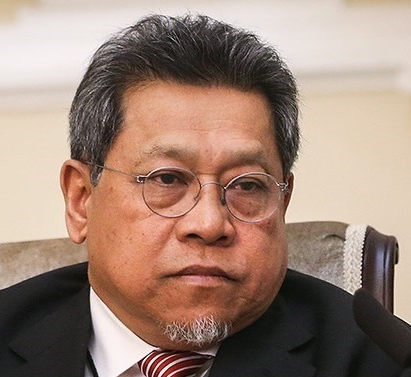 As the head of my household, I too have bills to pay, medical bills to attend to, and a household to run,” the Pekan MP said in a statement on July 11, claiming that he was a victim of a “draconian act” by the Government. Nazifuddin posted several photos of his time in Moscow on Sunday (July 15) when France beat Croatia 4-2 in the nail-biting final. In one photo, he is seen posing with Zabivaka, the football-playing wolf who is the Russian World Cup mascot. He posted photos of himself giving a thumbs-up at the Luzhniki Stadium and also shared a photo op with retired French international footballer Christian Karembeu. “Yeah! Finals!!! Croatia against France, which is your choice?” Nazifuddin wrote. On July 5, Nazifuddin set social media on fire after he was spotted wining and dining Taiwanese actress Celia Chang in Taipei. Taiwanese portal Apple Daily said the pair was seen dining at a steakhouse and having a massage at a top luxury shopping district near Taipei 101. The Secretary General of the Olympic Council of Malaysia’s jet-setting lifestyle has raised eyebrows as Umno grassroots supporters rallied to raise RM489,166 to help pay the RM1mil bail for his father, Datuk Seri Najib Razak, and for his legal fees. A week ago before Nazifuddin’s trip to Moscow on July 10, Najib settled his bail after being charged with three counts of criminal breach of trust and another charge of abuse of power involving RM42mil linked to SRC International Sdn Bhd, a former subsidiary of 1Malaysia Development Berhad (1MDB). While the family amassed enough funds to pay bail, Najib and his three children claimed that their bank accounts had been frozen in relation to the 1MDB investigation. “The last Parliament’s experience was extremely shameful in terms of the Speaker being impartial and fair. The conduct of some MPs and the refusal of the previous Speaker to allow a debate on the 1Malaysia Development Berhad (1MDB) scandal, he said, had left much to be desired. “I don’t think we have ever had a Parliament that has shown such impotence and disregard for the problems of society. The Swiss Attorney General Micheal Lauber said he was confident the money laundering probe into scandal-hit Malaysian fund 1MDB would bear fruits and this despite Malaysian authorities’ refusal to cooperate. “It would have been very desirable from our perspective if Malaysia had cooperated,” he said. To recap, Malaysia’s Attorney General Office, despite repeatedly saying it will cooperate with any foreign agencies investigating the 1MDB scandal, refused to reply to the Swiss Attorney General’s office request for detailed information on the issue. In a chilling response, the Swiss AG said: “It’s not hopeless, in fact it’s the opposite,” while addressing a news conference. He said the probe was making progress, based on money-laundering reports, bank documents and work with Singapore and other countries. But “we’re still confident that we can successfully conclude the process in this area, in particular in the open cases against the two banks,” he said, referring to Swiss private banks BSI and Falcon. Malaysia rebuffed Switzerland’s request for legal assistance in probing 1MDB on several occasions, Lauber’s office had said in November. In his report, Lauber repeated his remarks that his probe of Malaysia’s scandal-hit state fund 1MDB has been hampered by Malaysian authorities’ refusal to co-operate. PRIME Minister Lee Hsien Loong has apologised for the ongoing family dispute involving him and his two younger siblings, admitting that the episode has affected Singapore’s reputation and Singaporeans’ confidence in the government. In a statement to the nation that was also recorded on video, he announced that he will deliver a ministerial statement when Parliament sits again on July 3 to “refute the charges” levelled against him by his siblings Lee Wei Ling and Lee Hsien Yang. In a rare move, PM Lee, who is also the secretary-general of the ruling People’s Action Party (PAP), has instructed that the PAP party whip be lifted that day. He said that all members of Parliament will have the opportunity to raise questions for themselves and their constituents. PM Lee urged all MPs, including those who are not from the PAP, to examine the issues thoroughly and question him and his Cabinet colleagues “vigorously”. “Much as I would like to move on, and end a most unhappy experience for Singaporeans, these baseless accusations against the government cannot be left unanswered. They must be and will be dealt with openly and refuted,” he said. PM Lee hoped that this “full, public airing” in parliament will dispel any doubts that have been planted, and strengthen confidence in Singapore’s institutions and the system of government. He assured all Singaporeans that this matter would not distract him and the rest of the Cabinet from their responsibility to govern Singapore, and to deal with more important national issues, including the pressing economic and security challenges that the country faces. “As public servants, my ministers and I will always protect the integrity of our institutions, and uphold the strict standards separating private affairs from our public duties,” said PM Lee.